This lake is a wonderful boating lake and popular for water skiing. St. Lukes run their annual Ski for all event on this lake (water skiing for those with disAbilities). Sailing on this lake is also popular with winds that tend to come from the south mostly but sometimes from the north, and really makes for some nice reaches. 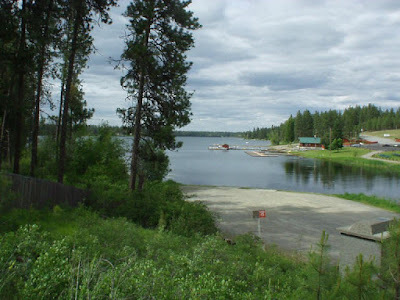 Located 2 miles south of the town of Medical Lake, Clear Lake is 2 miles long with a 1/2 miles wide, and 120' deep. I have sailed this lake many times with consistent winds each time I have sailed on this lake. Of course when it gets really hot out is when you will have the least about of wind, but then is great for water skiing. The North and South end of these lakes are the places to fish with lots of weeds, etc. for the fish to hid in. 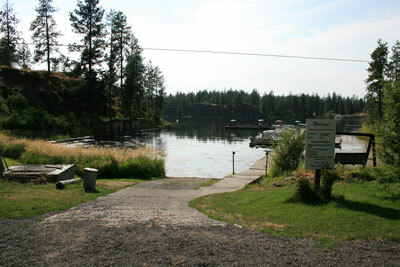 This lake has 3 a resort and a public access on the south end. There is the military recreational facility/resort on the south end and next to it is the lakes sole public boat launch. On the North and South end of the lake are the two public resorts. Directions: From Spokane, go west on Interstate 90, go 16 miles to Salnave Road, then north on Salnave Road 50' to Clear Lake Road, then east 1 mile on Clear Lake Road to Public Fishing Area. Info: Mallard Bay Resort (509-299-3830) is on the South end of the lake, with RV and tent sites, cabins, docks, boat rentals. The boat launch is paved with no power lines or branches hanging over the launch. This resort is CLOSED Wed. & Thur. of each week. and is open from the first Sat. of April through labor day. SUN COVE RESORT (509-216-6776 (http://www.suncovervclearlake.com) Resort is on the North end of the lake with RV & Tent sites, along with some unique floating cabins (you can fish right out your front door), docks, and boat rentals. The boat launch paved but is not suitable to launch a sailboat from due to the 2 power lines that cross it. If you are in the military there is the CLEAR LAKE MILITARY RESORT, ask about this resort through your leaders to get more info. This Military Resort has RV & tents, sites, a play ground, and more. The boat launch is paved. 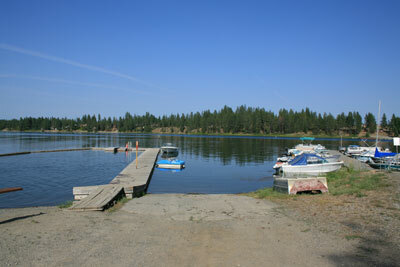 The PUBLIC BOAT LAUNCH is paved and Low water conditions make launching trailerable keelboats difficult. No power lines or branches interfere with launch a sailboat from this site. Maps: See printable lake map below. To visit google.com/maps and type in Medical Lake, WA. then pan in a little and move S.W. and you will see the lake on the map. 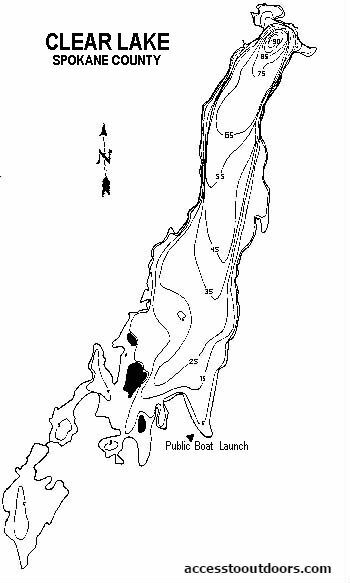 Only public launch on the lake with accessible restroom and double lane cement launch. ACCESSIBILITY: PARKING... Large gravel parking lot; PATHS/TRAILS... None. Wide gravel path to water next to launches; RESTROOMS/FACILITIES… Fully accessible restrooms; SENSORY... No sensory tactile markers for those with visual and other impairments. DOCKS/LAUNCHES/PLATFORMS… No dock. Double cement lane launches; DIRECT WATER ACCESS… No access for wheeled mobility devices. With assistance one utilizing a wheelchair could get to the water at the wide gravel area next to the launch, depending on water level; TRANSFER SYSTEMS... None; CAMPING... None at launch. There are two camping resorts on this lake; O.T.H.E.R… Oddities/Barriers: Depending how far one is in the water that lake bottom is muddy; Terrain: Level to about 3% grade at launch; H2O/Water: Water normally murky. Water temperature in the summer can be around 60 to 70 degree; Environmental Conditions: Nothing unusual; Resources: Food, drinks, and gas off of I90. Mallard Bay Resort (509-299-3830) on South end of the lake. RV, tent sites, cabins, docks, boat rentals. Paved boat launch. CLOSED Wed. & Thur. of each week. and open... April through labor day. ACCESSIBILITY: PARKING... Large gravel parking lot; PATHS/TRAILS... Short paved path to main dock. Wide gravel path to beach and launch; RESTROOMS/FACILITIES… Restrooms but not fully accessible to wheelchairs; SENSORY... No sensory tactile markers for those with visual and other impairments. DOCKS/LAUNCHES/PLATFORMS… Two docks, the larger of the docks is considered accessible to wheeled mobility devices. U shaped dock around swim area is not accessible to wheelchairs. Single gravel launch; DIRECT WATER ACCESS… No access for wheeled mobility devices. With assistance one utilizing a wheelchair could get to the water at the swim area; TRANSFER SYSTEMS... None; CAMPING... Tent and RV campsites with hookups; O.T.H.E.R… Oddities/Barriers: Nothing unusual; Terrain: Level to about 3% grade at launch; H2O/Water: Water normally murky. Water temperature in the summer can be around 60 to 70 degree; Environmental Conditions: Hot summer temperatures; Resources: Food, drinks at this resort, and gas off of I90. Sun Cove Resort and Launch (509-216-6776) on the North end of the lake. 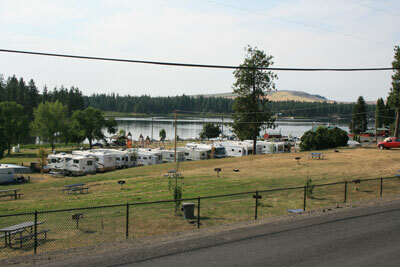 RV, Tent sites, Floating Cabins, docks, boat rentals. Paved boat launch...not suitable for sailboats due to power lines. ACCESSIBILITY: PARKING... Large gravel parking lot; PATHS/TRAILS... Wide gravel path and lawn to beach area and launch; RESTROOMS/FACILITIES… Fully accessible restrooms; SENSORY... No sensory tactile markers for those with visual and other impairments. DOCKS/LAUNCHES/PLATFORMS… Three docks. Docks can be accessed by wheeled mobility devices. One long dock next to paved single lane boat launch and swim area, two other docks for mooring and fishing; DIRECT WATER ACCESS… No access for wheeled mobility devices. With assistance one utilizing a wheelchair could get to the water at the swim area; TRANSFER SYSTEMS... None; CAMPING... Tent and RV campsites with hookups; O.T.H.E.R… Oddities/Barriers: Nothing unusual; Terrain: Level to about 3% grade at launch; H2O/Water: Water normally murky. Water temperature in the summer can be around 60 to 70 degree; Environmental Conditions: Hot summer temperatures; Resources: Food, drinks at this resort, and gas off of I90. Bob, September 16, 2016 at 12:27 PM: "Sun Cove Resort," previously known as Dan's Landing... you can find them at http://www.suncovervclearlake.com and follow along as they improve the services found at this popular little resort.